Rewards can be powerful management tools, but only if you implement them effectively. In this installment of the Management Chronicles, discover how the right timing and getting to know your employees better can improve the impact of your recognition method. For software to be reusable, it must be usable in a variety of contexts, and an important attribute of reusability at the code level is genericity. Learn more about defining for reuse and using generics. Putting together a successful team is always a challenge, but assembling a global team can be almost overwhelming. These tips can help you overcome the obstacles to hiring the best offsite developers for your project. Suppose you were testing an application that you had never seen before with no time to prepare, no specification, no documentation, no reference programs, no prepared test cases, no test plan, and no other person to talk to. How do you know that what you are seeing is a bug? Ever wondered what productivity experiments on factory workers in the early twentieth century have in common with today's adoption of agile practices? Lee sheds some light on the "process of process" and the importance of retrospectives as catalysts for change. When these information architects were assigned to a team that was struggling to achieve CMMI Level 2, they found little user buy-in for the new processes. Find out how introducing user-centered design to the project got everyone involved in the design process and increased the users' satisfaction in the end product. Despite the hype, test-driven development is not as easy as child's play. Successful implementation of TDD requires discipline and an understanding of the potential pitfalls. This article examines the "fine print" of TDD and explains how following some guidelines can help you make it a valuable addition to your development toy box. 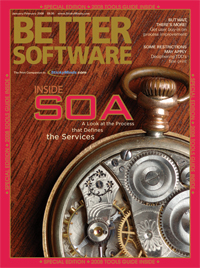 Building on a May 2007 Better Software magazine article by Dan North, this month’s cover story continues a look inside service-oriented architecture that emphasizes the process that defines the services rather than the technical specifics. However, this article does use standard technologies—Java, XML, SOAP, WSDL, and POX to further describe a practical implementation of the vacation-booking service described in Dan’s article.